Your favorite play-along recording for concert B flat blues. I recommend Jamey Aebersold's Volume 42 Blues in All Twelve Keys. This exercise is designed to give beginning improvisational musicians a different perspective on creating a solo. It's important for beginners to remember that improvisation is a form of communication. This exercise will help the improviser focus on creating an overall shape for a solo rather than focus on the small details of what specific licks to play. Blues scales are an excellent tool to use in solos. 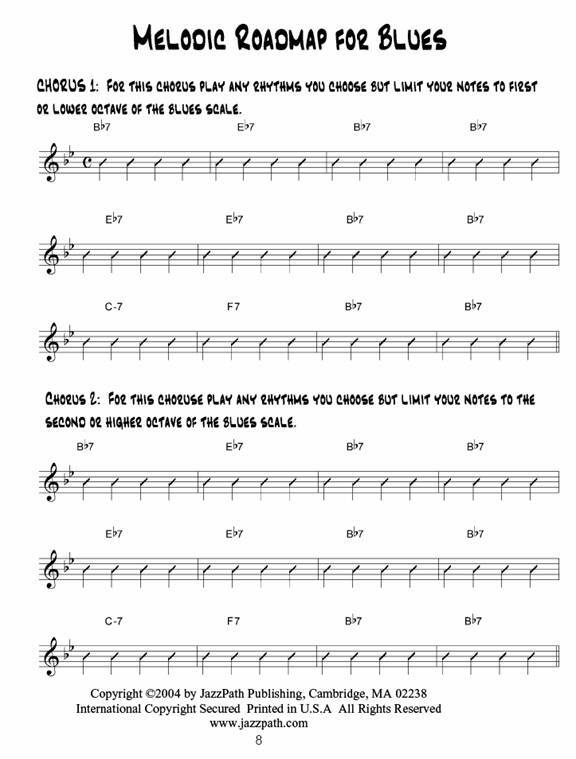 Blues scales are simple to play and sound good virtually all of the time within a blues solo. It's extremely important that the scales are memorized. It is not possible to improvise a good solo if you're worrying about playing the wrong notes or have to spend time thinking about a scale. Memorize the blues scale that is appropriate for your instrument. Play it in as many different ways as possible. For this exercise we are going to use a 12 bar blues form. The form looks like this. This is written in concert key. At this point, the chord progression in blues is not important since we will be using only the blues scale to improvise. It is extremely important that you can recognize when the twelve bar chorus is complete. Practice listening to the blues play-along recording and following the 12 bar progression until you can recognize the beginning and end of each 12 bar chorus. Imagine that you're going to have to improvise three twelve bar choruses of blues for an upcoming concert. Where do you begin? Do you just play whatever you want? Do you just explore the blues scale and hope you stumble across good ideas on the day of the concert? The first step in improvising a great solo is coming up with a plan. I call these plans melodic roadmaps and you will find them extremely helpful when you are improvising. When you're improvising you're using music to tell a story. The audience is listening to you and waiting for you to communicate. The audience isn't waiting for literal communication; they are waiting for emotional communication. So how does a beginning improviser communicate with the audience? In this case, you're going to use tension and release to develop an overall shape for your solo. This shape will enable you to communicate with the audience. How does an improviser build tension? Of course when you're just learning to improvise it isn't possible to think of all of these things and integrate them into your playing. That's why we're going to make a road map that you can follow. 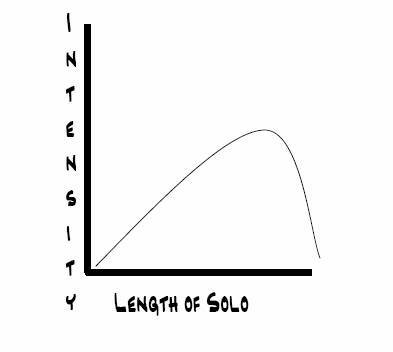 First I'll give you an overall shape for the solo. For this solo I would like you to try to create this shape. The solo will be three choruses long. The first two choruses are going to build in excitement to a peak at the beginning of the third chorus and then quickly settle down for the end of the third chorus. This should create an exciting shape for a short solo. We will use 2 basic tension tools for this solo. The first tool that we will use is to play in increasingly higher registers. The second tool will be the use of sustained notes to build tension. All notations will be done in tremble clef and concert key. 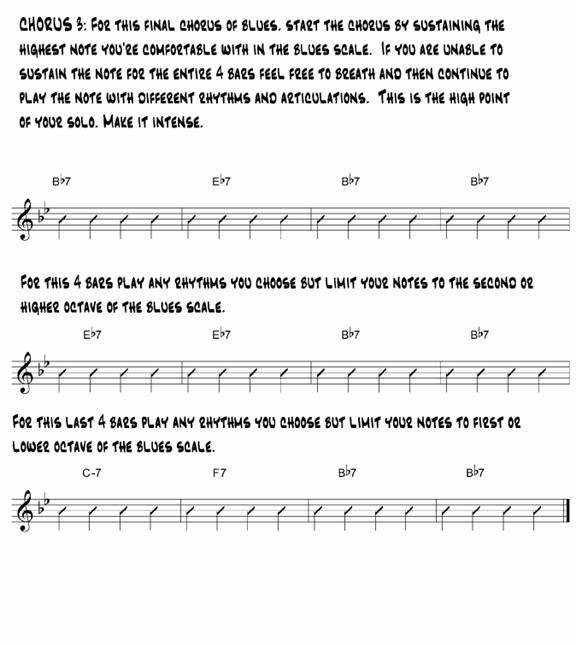 Use the blues scale that is appropriate for your instrument. Repeat this roadmap until you can accurately convey the shape and direction of the solo to an audience. It may help you to record yourself and critique what parts of the solo are successful and what parts are not. Experiment with different roadmaps. They will improve your improvisation without requiring you to learn extensive harmony right away!